Jane Fonda: "I'm so sad that we still have to do this"
Tens of thousands of protesters have demonstrated in Washington to demand the withdrawal of US troops from Iraq. The rally comes days before Congress is to discuss President George W Bush's new strategy for Iraq - including the despatch of 21,500 additional troops. 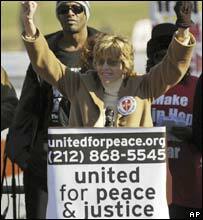 The protesters, chanting "Bring the troops home", were joined by Vietnam War-era protester, actress Jane Fonda. Violence continued in Iraq on Saturday, with at least 15 killed in a suicide bomb attack in a Baghdad market. The BBC's James Coomarasamy in Washington says this anti-war rally at the foot of the US Capitol was a marked shift away from the White House and on to Congress. The protesters want Congress, now run by the Democrats, to block funding for the president's new strategy, our correspondent says. Jane Fonda, the Hollywood actress who angered many Americans by visiting Hanoi in 1972 during the Vietnam War, told the crowd: "I haven't spoken at an anti-war rally for 34 years. But silence is no longer an option." She added: "I'm so sad that we still have to do this, that we did not learn the lessons from the Vietnam War." Fonda was joined by fellow actors Sean Penn and Tim Robbins. Robbins said: "What we need is courage, courage and conviction and we need people to represent the voice of the American people, a very clear voice last November, a voice that said: 'We're done with this war'." The Democrats took control of both Houses in November's mid-term election, sparking Mr Bush's decision to form a new strategy for Iraq. But our correspondent says Congress has so far balked at using the power of funding and only a handful of staunch anti-war Congressmen were present at the rally. Although nearly all Democrats and a growing numbers of Republicans oppose the president's plans, he says, senators have not been able to agree yet on a single non-binding resolution expressing their concerns. At the rally a coffin covered with a US flag and a pair of military boots was put on display. Organisers also filled a large bin with tags bearing the names of Iraqis who have died. More than a dozen veterans, anti-war activists, religious heads and actors addressed the crowd. A small counter-protest held up a Fonda doll with the sign "Jane Fonda American Traitor". Mr Bush reportedly reaffirmed his commitment to the troop increase in a phone call with Iraqi PM Nouri Maliki on Saturday. White House national security adviser spokesman Gordon Johndroe said: "Americans want to see a conclusion to the war in Iraq and the new strategy is designed to do just that." The US military announced the death of seven more soldiers. Three were killed by a roadside bomb north of Baghdad on Saturday, two by roadside bombs in Diyala province on Friday and two by a bomb in east Baghdad on Thursday. Also on Saturday, Russia said it planned to question the US on its increasing military presence in the Middle East. Foreign Minister Sergei Lavrov said he would seek an explanation during a visit to Washington next week. He also said it was his "deep conviction that Iran and Syria should not be isolated and must be involved in the settlement process".